Filmmaker Ken Burns recently gave the keynote address at the Country Music Association’s board of directors meeting. Burns was joined in his address by longtime collaborator Dayton Duncan. Burns and Duncan’s presence currently looms large in the country music community, with the Emmy Award winners hard at work on a major series profiling the history of country music. The series is scheduled for release in 2018. 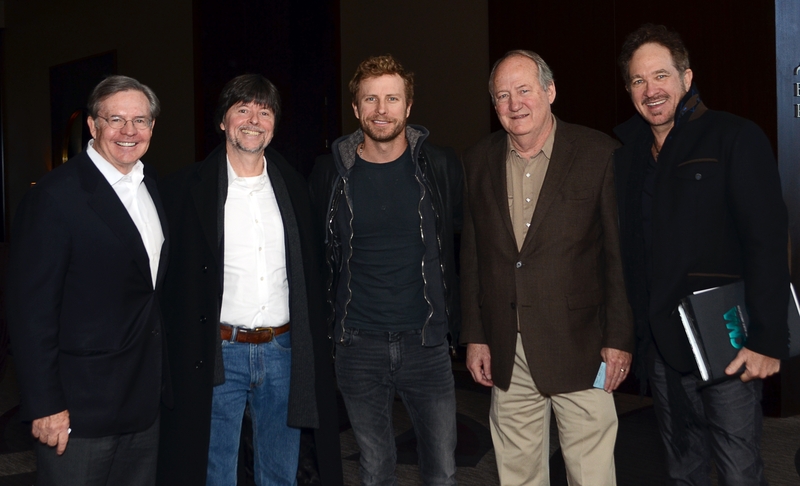 Jim Free, CMA ex-officio board member and President/CEO of The Smith-Free Group; Ken Burns; Dierks Bently, CMA board member; Dayton Duncan; Kix Brooks, CMA board member. Based on Burns’ previous performances, he may be in the process of creating the definitive documentary on country music. Fans should look forward to riveting storytelling, plenty of previously unseen archival footage and the occasional bombshell challenging conventional wisdom about the genre’s history. The documentary should be welcomed for another reason as well. By focusing his prodigious talent and unmatched reputation on the subject of country music, Burns lends enormous weight to the genre’s cultural significance as well as its critical importance as an art form. There is only one downside to all of this: three years feels like a long time to wait.